Is fully working and the cabinet is excellent. I think you will struggle to find a better example. All of our pinballs are workshopped and cared for. We do a lot of driving so may be able to deliver - please just let us know where you are and we will offer a price. Otherwise it can be collected from us here in Northampton. We have no way of proving it - but just to say this pinball has been hired to The Who back stage at a few concerts - did ask for them to sign it one day - but sadly never happened. Have just noticed that in the backdrop of one of the photos is a backdrop graphic that was used at the relaunch of a digitalised version of Tommy. Prove a thing - I know. 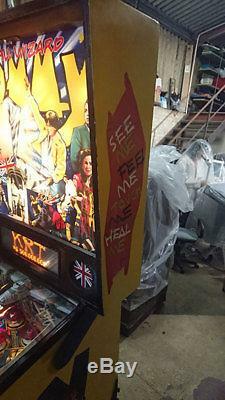 Here are the details about this pinball on Wikipedia. The Who's Tommy Pinball Wizard. From Wikipedia, the free encyclopedia. 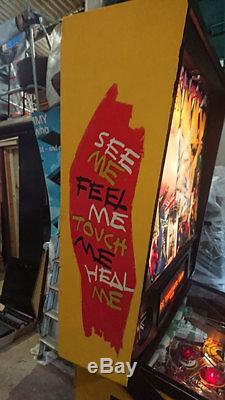 A photograph of the pinball machine via WakefieldPinball. 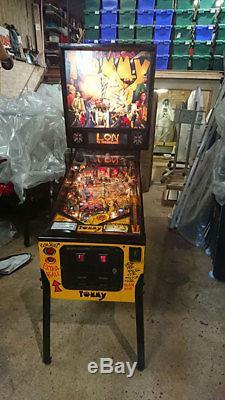 Joe Kaminkow, Ed Cebula, Lonnie D. The Who's Tommy Pinball Wizard is a pinball. Machine based on the rock musical The Who's Tommy. The machine features twenty-one songs from the musical sung by original Broadway cast members. The machines were designed by Joe Kaminkow, Ed Cebula, Lonnie D. The machine was built using Solid-state electronics. The backboard of the machine has a dot matrix display with animations by Kurt Andersen and Markus Rothkranz. 4,700 machines were manufactured by Data East. There are three skill shot bonuses possible on the launch of each new ball. Two of which award increasing point values, and the third initiates a multiball if lit. The main game modes of the table are accessed by lighting the entire Union Jack on the playfields center. There are 12 mini-games in this mode based on various scenes and scores from the musical. Completing these 12 modes unlocks the Pinball. By lighting the letters to spell T-O-M-M-Y then hitting one of two scoops. Depending on which scoop activates the multiball, the player is given either 3 or 4 balls. This mode has multiple subsequent stages, each awarding greater point values as jackpots. The separate Game modes follow the plot of the musical. The musical consists of two acts and a total of twenty scenes, with the highlights of those scenes replicated with dot. Animations on the backglass of the machine during the twelve Union Jack modes as well as Tommy Mode. The music for the machine consists of stage adaptations from the original Rock opera Tommy. There are 21 songs total programmed to play throughout gameplay and for various stages and modes. Songs include Captain Walker, It's a Boy, Sparks, Christmas, See Me Feel Me, Smash the Mirror, Fiddle About, Cousin Kevin, Sensation, The Acid Queen, Pinball Wizard, Listening To You and Sally Simpson. To launch each ball, the player can use either an automatic launch by pressing a flipper button while a ball is in the alley, or manually via the spring plunger assembly. The machine includes an automated silver disc that rotates to cover the flipper portion of the machine to emulate playing pinball as the title character. This mode occurs during each multiball sequence, or for the entire duration of the game by player selection of the Tommy game mode. The item "The Who Tommy Pinball Machine" is in sale since Sunday, April 08, 2018. This item is in the category "Video Games & Consoles\Coin-Operated Gaming\Pinball Machines". The seller is "jukebox45s-uk" and is located in northampton. This item can't be shipped, the buyer must pick up the item.